When they were younger, Tom and Emma were best friends but as they got older, that wasn't cool anymore. 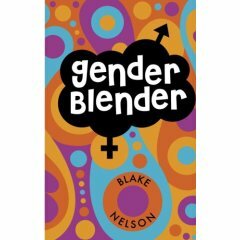 Now, in 6th grade, they are forced to do an assignment together in health class where they have to report on the differences between the genders. But nothing can prepare them for the surprise of being swapped and finding themselves in each other's bodies! A clever idea handled a bit awkwardly. Admittedly, this book is targetted to a younger reading audience, but it is still awfully clunky. A blurb on the back compares Blake to Judy Blume and that seems like a fair comparison, but not in a way that I would consider complimentary. Like Blume, Nelson doesn't really trust his audience to figure things out. Instead, he force feeds the story to the reader. It might have read a lot better in first person (third-person narrative is a deadly tool to use in what should be such a highly personal experience).